From our "What Keeps Us Up at Night" Department comes this question. Like, why do birds fly, what if the sun never set? Where did Rocky Road ice cream get its name? Hmm... anyway, why don't we try to figure out the one about the sunset thing? been already several days, I'm guessing the planet has probably stopped spinning. And this leaves us with all kinds of disturbing notions. The first thing you would feel if Earth stopped spinning would be a mighty jerk. Our planet rotates at a velocity of 1,037 miles per hour! then the driver suddenly slams on the brakes. lucky if they are wearing seat belts! But you wouldn't have a seat belt on when Earth stopped spinning. That's incredibly fast, but even this speed is still not enough to launch you in space. That's why, unfortunately, you'll be only flying over the surface of the planet. Until you hit something – going a thousand miles an hour. would keep moving for a while. This would make for winds and waves you've never seen before, even on TV. But you know the worst thing that would happen? The winds would damage and erode the earth's crust. Then, any break in Earth's spinning would mess up gravitation. a 38-degree angle from the previous vertical "down." And it would knock down the rest of the buildings and vertical constructions. Now the Earth's spin creates a force which keeps oceans in place. If Earth stopped, all the water in the seas and oceans would tend to head toward the poles. 212 degrees F. The central supercontinent at the equator would get the most heat. As a result, rivers and lakes would boil away. Thus, any semblance of life would remain only along narrow strips of land near the coast. is usually kept in place by the planet's gravitation force). You probably know that the atmosphere protects the planet from cosmic radiation. That's why the consequences of losing the atmosphere would be – shall we say, bad! Our beautiful green planet would turn into a lifeless lump of rock. Well, that's a pretty scary scenario! 1.9 trillion years to stop existing. Bright Side and 5 minute Crafts. But hold on -- this isn't the only catastrophic scenario which pops up in my head at night. What about this: what if the Sun suddenly turned into a black hole? 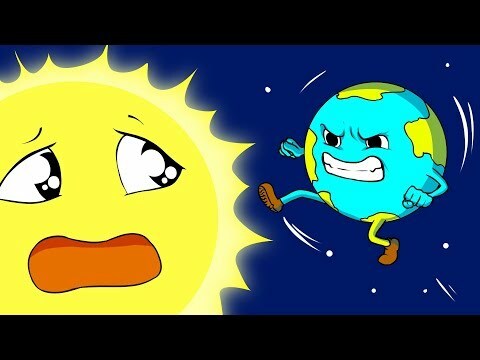 Would our planet get sucked inside and disappear? Well, research indicates this won't happen. It turns out that the Sun isn't big enough to turn into a black hole! one, just 4 miles across. So Earth wouldn't get sucked inside, and we're all relieved. Only there wouldn't be this warm ball of light in the sky anymore, and the planet would freeze. and the world would turn into one huge freezer. But your beer would stay cold. But wait, what if a stray black hole entered the Solar System? Would it be able to swallow Earth? Don't I really need to get some sleep? planets disappear one by one. You'll also notice your neighbors disappearing too. Whoops there goes another one! already start to feel its gravitational pull. our planet is one in a trillion. Worse odds than the super lotto. So let's move to the next troublesome question: what if the Sun threw up – I mean blew up? If it happened one day, our yellow star would turn into a much cooler red giant. During this transformation, the Sun would consume Venus, Mercury, and Earth. At first, you would be oblivious to the solar explosion that's just happened. It takes sunlight 8 minutes and 20 seconds to reach Earth. - precisely 8 minutes and 20 seconds. That's why I'm leaving with the Dolphins before it happens. If the Sun exploded, it would shoot out a huge amount of very powerful energy. Well, there's no way to spin this to a happy ending, is there? As you see, it's in our best interest to keep the Sun safe. But what if a gigantic comet crashed into our star? Would the Sun suffer from such a collision? Would you like to lock me up in the garage now? would catch it and accelerate its steep fall up to 373 miles per second. A few moments later, the comet would explode and release X-rays and ultraviolet radiation. It would look as if a bomb was blown up on the Sun. With a gigantic comet, the collision might even cause sun-quakes in the solar atmosphere. so, I guess, there's no point in worrying about this scenario. Do you have any other what-if questions left unanswered? Go ahead and write about them in the comment section below and let's discuss them together! to the channel to move to the Bright Side of life!